Whenever time and finances allow, there are few things I enjoy more than eating dinner with friends. Last night, I experienced dining at its finest! I had a free meal with a special friend. We ate cereal, cookies, cupcakes, ice cream, pasta and soup. The non-stop conversation was meaningful, and at the end of the meal our bellies were full. A few times I tried to stand to stretch my legs or to go in and join the “grown-ups” in the other room – only to be instructed to sit back down in order to talk and eat a little longer. Fortunately, I used no Weight Watchers points during this meal. The food was imaginary and my grandson-friend is two years old. It was just the two of us, conversing and enjoying each others company. This special meal brought to life a scripture I read today in Rev. 3:14-20. These are the words of the Amen, the faithful and true witness, the ruler of God’s creation. I know your deeds, that you are neither cold nor hot. I wish you were either one or the other! So, because you are lukewarm–neither hot nor cold–I am about to spit you out of my mouth. You say, ‘I am rich; I have acquired wealth and do not need a thing.’ But you do not realize that you are wretched, pitiful, poor, blind and naked. I counsel you to buy from me gold refined in the fire, so you can become rich; and white clothes to wear, so you can cover your shameful nakedness; and salve to put on your eyes, so you can see. Those whom I love I rebuke and discipline. So be earnest, and repent. Here I am! I stand at the door and knock. If anyone hears my voice and opens the door, I will come in and eat with him, and he with me. This passage of scripture (especially verses 20, 21) is often misused, especially when read out of context. These verses were never intended to instruct one on how to become a Christian. These words were written to a church in Laodicea (an ancient Roman province of Asia). Since this letter was addressed to a church, the recipients of this letter were individuals who had already become Christians. These verses, however, do relay a most amazing message! My grandson wanted to share a “meal” with me. He was looking for my devotion and attention – my heart. He was actually better at this dining experience than I was. He was not distracted with “more important” things. 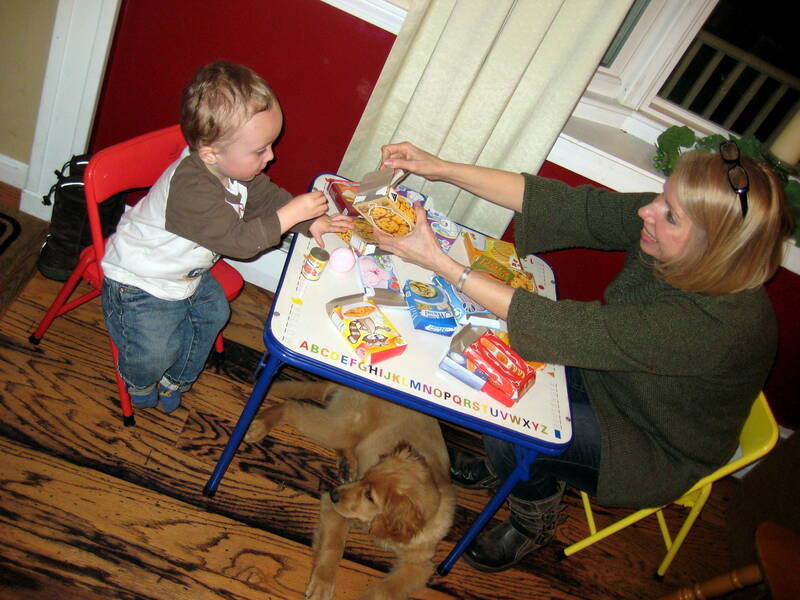 I’m touched that my grandson wanted to sit and eat with me. I’m floored that my Creator wants to come and “eat with me”. I know he is looking for my devotion, my attention – my heart. Yet I can too often become distracted with other things vying for my attention. I know nothing is more important than His presence in my life. Why should I ever want, through complacency, distraction or apathy – to leave a meal with Jesus? He provides that menu that truly fills me and the ambiance that brings peace, comfort and security. Are you enjoying His presence at your table, or is he banging at your door? What a joy to connect. I need, love to laugh and your writing offers me that opportunity! Your encouragement means a lot! I finally got onyour blog and have begun reading. I’m sorry it took me so long! You have such a special gift to bring to light the spiritual lessons of life and the Word of God! Thank you for sharing it with us all! Kelly, You are so encouraging. Thanks so much. It means a lot. Love you!